This mix makes the best pancakes! Love the canisters! Love Robby's!! This mix is the best! It makes me a superstar chef. We have been using and eating Robby's on Treasure Island, FL since 1973. I have been a pancake lover since I was able to chew. I am also very picky about how my pancakes should look and taste. We have one pancake house that is over 50 miles away and we go there just for the pancakes. It is a Christian family that owns it and one day I asked the waitress if she knew who's recipe they use. She told me it was Golden Malted and gave me the email address off of the container. I have been ordering it ever since. We still go to that little restaurant when we are in the area but now I can make these delicious pancakes for us whenever I want. 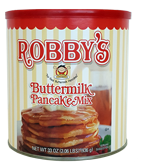 I have tried all of the flavored ones also and they are wonderful, but I am an old fashion girl and I love Robby's Buttermilk pancake mix. I will also give you a little tip, instead of using milk or water I use additional buttermilk and they are amazing. I also use melted (real) butter instead of oils. Yum, Yum! Yeasrs ago, after trying unsuccessfully to buy commercial mixes from pancake houses whose pancakes were superb, I tracked down the miller of Robby's mix who originally sold only to institutional customers. Be careful not to over-mix the batter. It's better to FOLD the dry ingredients gently into the liquid ingredients rather than mix vigorously -- it's ok to leave small pockets of undissolved solids. Then let it sit for at least 15 minutes to allow the reaction of the ingredients to generate bubbles. Resist breaking the bubbles and dissolving every small pocket of powdery mix. Leave some lumps.This will ensure a light fluffy pancake. Breaking all the bubbles and dissolving all the solids completely, so that the batter is completely smooth like frosting, will cause thin, heavy pancakes. Those who know and appreciate the more complex flavor profile of a superior pancake (a bit salty, light and fluffy with a buttermilk tang, a bit yeasty), then Robby's will probably exceed your expectations. I noticed that some are reporting good results using the mix for waffles. 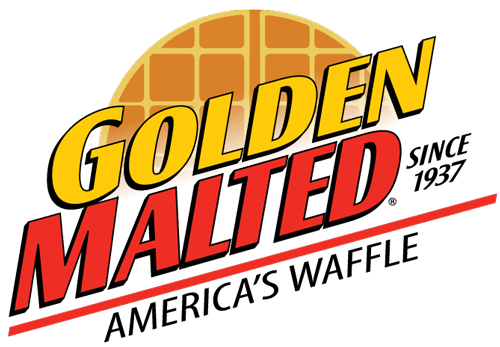 Years ago, I asked the miller why it's not called "pancake and waffle mix." His answer: "We don't recommend it for waffles. It's a pancake mix." Robby's makes delicious waffles also!